Bayview Village Shopping Centre offer more than 112 brand name stores. Bayview Village Shopping Centre is located in Toronto, Ontario - 2901 Bayview Avenue, Toronto, Ontario - ON M2K 1E6, Canada (GPS: 43.767948, -79.387057). Look at the list of stores in Bayview Village Shopping Centre, hours, location and information about mall and special events, sales, coupons. You can choose store from list below and get detail information - other stores locations for the brand, location, shopping hours, phone, map, directions contact. Bayview Village Shopping Centre is one of the best shopping place for spend your free time - mall/shopping center has all types of stores - outlets, department, fashion, traditional and more. Have you ever visited Bayview Village Shopping Centre? Do not forget to write shopping review and rate your satisfaction. Take Highway 401 east to the Bayview exit. Turn left (north). The second intersection is Bayview and Sheppard (that's us!). Turn right at the lights. The shopping centre entrance is on your left-hand side. Take Highway 401 west to the Bayview exit. Turn right (north). The first intersection is Bayview and Sheppard (that's us!). Turn right at the lights. 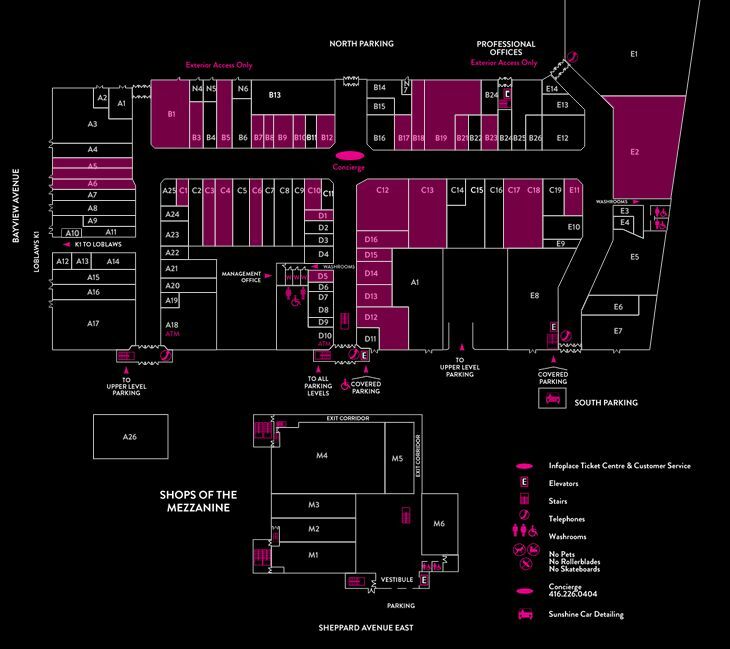 The shopping centre entrance is on your left-hand side. Take the Gardiner Expressway east to the Don Valley Parkway (DVP). Take the DVP north to Highway 401. Take the 401 west to the Bayview exit. Turn right (north). The first intersection is Bayview and Sheppard (that's us!). Turn right at the lights. The shopping centre entrance is on your left-hand side. Take Bayview Avenue north to Sheppard. Turn right at the lights. The shopping centre is on your left-hand side. Take Yonge Street north to Sheppard. Turn right at the lights (east). Proceed down Sheppard to Bayview (next major intersection). Continue straight ahead, the shopping centre entrance is on your left-hand side. Take Avenue Road north to the 401. Take the 401 east to the Bayview exit. Turn left (north). The second intersection is Bayview and Sheppard (that's us!). Turn right at the lights. The shopping centre entrance is on your left-hand side. Take Highway 400 south to Highway 401. Travel east to the Bayview exit. Turn left (north). The second intersection is Bayview and Sheppard (that's us!). Turn right at the lights. The shopping centre entrance is on your left-hand side. Take Highway 404 south to Highway 401. Travel west to the Bayview exit. Turn right (north). The first intersection is Bayview and Sheppard (that's us!). Turn right at the lights. The shopping centre entrance is on your left-hand side. Give us your experience with Bayview Village Shopping Centre by writing a short review.